Eat Local, Eat Great, Eat Friendly’s! Founded in the early ’8Os as a sandwich and cookie shop, Mr. Friendly’s New Southern Cafe has evolved into much more since its inception. Since 1995, we have been serving New Southern Cuisine in a sophisticated, yet casual environment using only the freshest ingredients and simple preparations. There are always ocean-fresh fish and seafood specials, as well as innovative meat, poultry, and wild game dishes. Our wine list is extensive and has won “Wine Spectator’s Award of Excellence” ten times. We also have a wide variety of micro-brew beer, small batch Bourbon, flavored Vodkas and single-malt Scotch. Our concept is simple: Great food, Great service and Great wine! 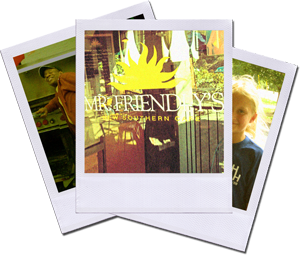 Take a minute to get to know us while you are here and please sign up for our e-mail list by sending an email to eatmrfriendlys@gmail.com. Every week we send out information on upcoming events, recipes, wine tips and much more.